Last year, I was really impressed when SAP announced the Data Hub. I saw it for the first time during the keynote at TechEd Las Vegas. There, Ian Kimbell showed the pipeline which collects IoT data and later visualizes them in a fancy way. If you go through the video (it is less than 6 minutes long), you will find three different ways he used to visualize the data. One year later, I decided to start and learn more about Data Hub. Then, I realized that 2 of 3 mentioned visualization techniques are not supported by default, or it is not so easy to create them. More visual examples at the end of the blog. Click here. I personally use developer edition and run Data Hub as a docker container on my local machine. 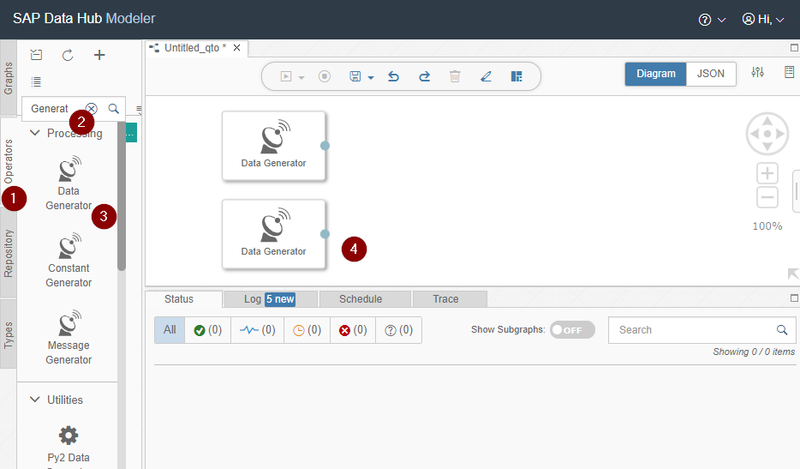 All examples are created and tested using this edition, but they (should) work also on any other environment since they use only very basic functionalities of Data Hub. To extract meaningful information from raw data. Unfortunately, Terminal is not so user friendly and it is not always easy to find specific “line” or specific “value”. If we want to monitor single or multiple sensor values, it would be impossible with this console view. For me, the ideal replacement for Terminal operator would be something that we can call Chart Operator which will graphically visualize sensor data in real time. 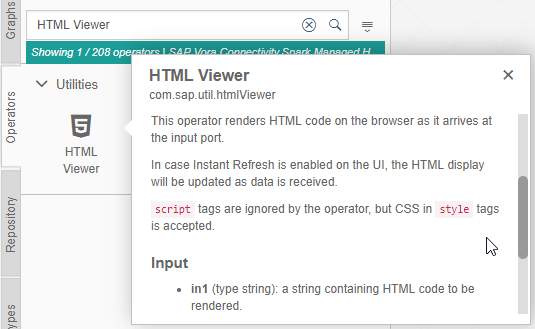 For that purpose, I found operator called HTML Viewer which shows any html received on input port. In other words, we would have to generate pure HTML and CSS code which will be visible as part of HTML Viewer, but with provided Instant Refresh functionality we could achieve continuous updates of our charts. 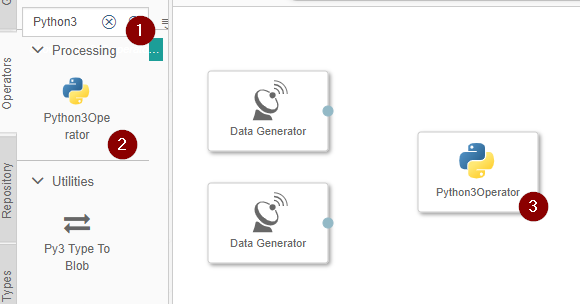 In next part of the blog, we will go though step-by-step process and create simple pipeline which starts with Data Generator and ends with HTML Viewer. 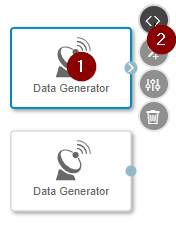 First we will create two Data Generator operators. They will simulate the streaming from two sensors. For simplicity, they will just generate random value in specified range and propagate it further. Repeat the step 3. Your diagram should be as in image below. We need two generators because we will have two values (sensors) in our chart display. The script above will generate new random value in range [20,60] every 500ms. This will the first input in our visualization graph. This step is the main one in this blog. We will create new Python3Operator which will accept two inputs every 500 ms (from two Generators) and produce single HTML string. Then we will forward this HTML string into HTML Viewer, the component responsible for displaying. Why Python? No special reason, it can be any other language that can produce HTML string. Type Python3 in search bar to find the required operator It is important that you choose Python3 and not Python2. Code example that we will use works with Python3. New window will be displayed. Populate it as in the image bellow. Click OK. Note: Names input1, input2, output will be used in the code inside operator. Your operator should look like in the image below. Now, when input and output ports are created, we will add the logic (python code) inside operator. Left click on your operator and choose the first option: Script. New tab will be opened with commented python code. You can delete everything from this code editor and replace with the code bellow. I know, it is long, but you could only be focused on the first section called Configuration. As you can see, the port names matches the values in configuration. For now, you can leave everything as is, but later you can experiment with different configuration values. Additionally, I will explain the main concept behind this script just after we start our pipeline. x_last_1 = None                       # x coordinate of last drawn point, in pixels. Depends on x_step value. y_range = y_max - y_min             # range of values calculated from configuration parameters. # calculate y value for input value. Input value is received from input port and must be integer or float. The last operator in your pipeline is HTML Viewer. 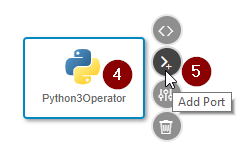 Find it in operator list and drag and drop next to the Python3Operator. Then, connect the blocks to get the pipeline like in the image below. That’s it! We have reached our goal! Let’s have a closer look into python code. It has one multi-line string field called html with the whole html definition. When the new point is received (in our case every 500ms) this html string field is changed, or more precisely the value #points_* is changed and all together is propagated further to HTML Viewer. As you can see, every new arrival on input port creates new <polyline> html object and just append it to the previously created chain of <polyline> objects. With this technique, if someone is just looking at the screen, he will see only the difference or newly arrived value. Mihailo, thank you for very nice blog, and congratulation on your very first one! You can think about similar in your data generator operator. I agree, probably I will write another blog in upcoming weeks where I can use real IoT payload as an input for visualization.